Both Muslim and Christian residents of Kano, the northern Nigerian city where at least 160 people were killed in a series of attacks on Friday, have been urged to heed a day of prayer. A special prayer session has been held near the palace of the Emir of Kano, asking Allah to help end the violence. Islamist militant group Boko Haram says it carried out the attacks. At least 12 locally made explosive devices have been found in abandoned vehicles in the city, police say. Doctors say that more bodies are arriving in the morgues and so the number of people killed in the series of bombings and shoot-outs is expected to rise. The BBC's Abdullahi Kaura Abubaker in the city says that some people are starting to resume normal activities in the city but that a heavy security presence remains. An overnight curfew is also in place. The call for prayers was issued by both the Kano state government and the Emirate council on local radio stations. Both Muslims and non-Muslims were urged to gather at their respective places of worship. Our reporter says about 200 people attended Kano's central mosque, while local mosques around the city also held prayers. Kano is the largest city in the mainly Muslim north but it has a sizeable Christian community. Boko Haram targeted worshippers at several churches on Christmas Day and one faction has urged southerners, who are mostly Christian or follow traditional beliefs, to leave the north. Hundreds of people have fled their homes but there have also been cases of members of the two communities supporting each other. 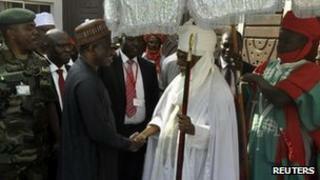 President Goodluck Jonathan visited Kano on Sunday to offer his condolences and vowed to defeat the "terrorists". However, our reporter says many people are sceptical, having heard similar promises in the past. The militants attacked several police stations and managed to free some suspected members of their group who had been detained. Boko Haram, which wants an Islamic state, said it launched the attacks because the authorities refused to free some of its members from jail. This is the deadliest attack the group has launched, although it has killed hundreds of people in recent years. Its members have bombed churches, government buildings and police stations - mostly in predominantly Muslim northern Nigeria. One doctor told AFP news agency that the final toll from Friday's attacks was likely to be about 250. "Although the bulk of the bodies were brought here [the main hospital], others were deposited at three other hospitals," the doctor said. Boko Haram, which loosely translates from the local Hausa language as "Western education is forbidden", says it wants to overthrow the national government and impose Islamic law. It first hit the headlines in 2009 when a series of attacks by its followers on police and government buildings in the city of Maiduguri led to a crackdown in which hundreds died. Since then, a wave of bombings and shootings have killed police officers, government officials and both Muslim and Christian civilians.